A request from Jerry Halberstadt, Coordinator, Stop Bullying Coalition—I am reaching out to seek your collaboration and input, regardless of your role in multifamily housing. Bullying affects all the stakeholders, and each role and individual brings some unique perspectives. I am asking that you respond to a simple questionnaire, your answers can be as short or long as you like. 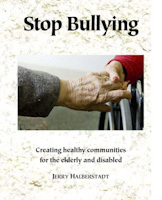 I have been working to identify the factors that promote or inhibit bullying. Based on all that I have observed and been told by so many who live or work in multifamily housing, I have started to create a diagnostic questionnaire that can help pinpoint the presence of these factors. I already have gotten some very useful results. In the recent workshop I did with Damainique Bruce, J.D., the Assistant Director/VISTA Project Coordinator and Michael Kane, Director of the National Alliance of HUD Tenants, two residents not only provided their experiences in their answers, but they participated in the discussion. We a very good turnout of VISTA volunteers as well as many of our coalition. The questionnaire also provides information to help us supply information about potential resources that are relevant to a specific situation. The questionnaire can be done fairly quickly and you can write as much or as little as you like, and there is room for you to offer your own observations and ideas for change. I will use your responses to learn more about the factors that foster or inhibit bullying, and I will use the findings in my own research and writings, and as background for my work with the Massachusetts Commission on Bullying. I will share the results through this newsletter and our website, as appropriate. I will not publish identifications of the collaborators or their residential or work settings without their prior approval. If you are willing to participate, or have questions, kindly contact me: http://stopbullyingcoalition.org/contact Be sure to include your email address!